Happy Friday loves! Hope you've had a great week and have some fun weekend plans ahead. We actually have a lot of fun plans! Tonight we're going to a local indoor winery with a few of our favorite couples and then tomorrow my cousin and her boyfriend are coming out our way so we can go to the Great Falls for a nice long hike. The weather looks like it's going to be low-70's and gorgeous! I also really want to go get pumpkins at some point this weekend. I wanted to share a couple awesome items that are currently discounted! I noticed that there were some great fall pieces on sale as I was browsing, especially my favorite Topshop distressed jeans and these Treasure & Bond Chelsea booties. I have had my eye on them and now they're under $60!! I also filmed another video on my more natural, everyday make-up routine! Would love if y'all checked it out. I've been trying to be more consistent in posting videos especially because I just love all the fall/holiday themed content! I always LOVE your makeup so thank you for the awesome tutorial, your chunky cream sweater is so pretty and looks great with the make up colors. Happy weekend beautiful babe! These are such great picks! I love the sweater dress! I've had my eye on those boots since they went on sale and I really need to get them. I have them in leopard and I'm obsessed with them! Have a great weekend and enjoy the hike, Kelly! Such great staples! Love the ankle boots. Have a lovely weekend. 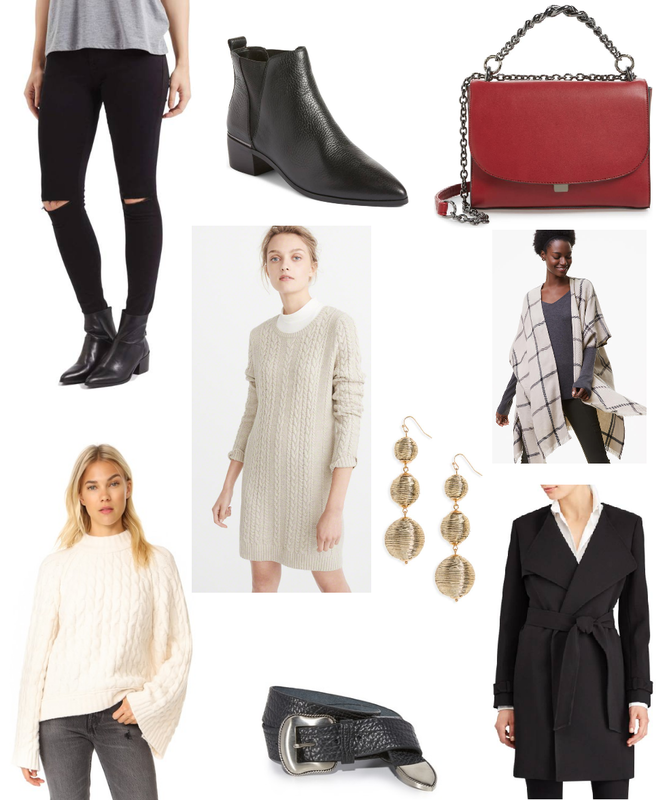 Totally agree that all of these pieces are fall staples. Yes!! That burgundy bag is just so pretty! DYING over those booties! Hope you have a great weekend! I love all of these picks. That sweater dress is so cute. Great picks! You are a natural on video and I LOVE your makeup! You always look so flawless! I need more black in my closet, especially a black cardigan. I love the makeup tutorial too, you're great on camera! That red bag is a fall must! I also love the ball earrings. They are great for dressing up fall outfits!